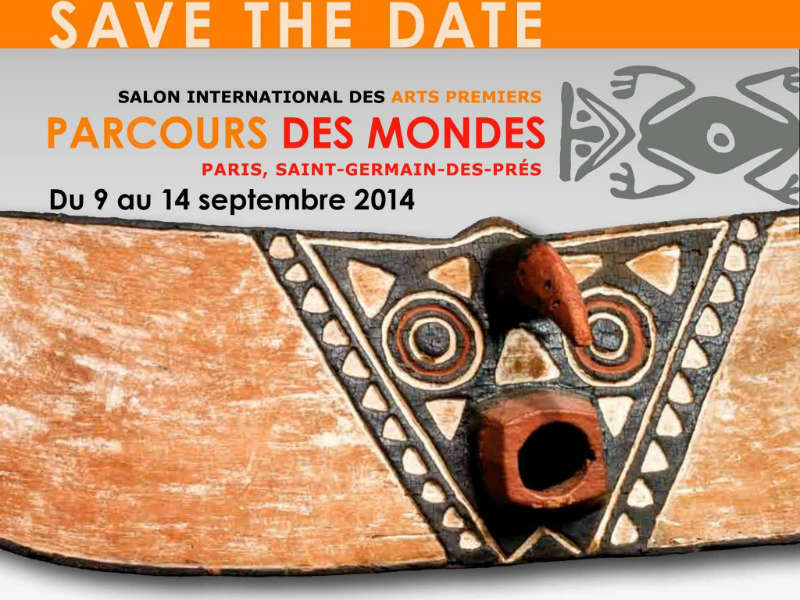 In two weeks more than 60 dealers will reunite in Paris for the 13th annual edition of Parcours des Mondes which will again present an unsurpassed scope of offerings. Earlier this month the organization launched their new website where you can already find a preview. Last year, while everybody and their mother was gossiping about the Hampatong figure at Galerie Schoffel de Fabry (info), art history was in the making when a New Jersey based collector acquired the male pendant of an important female Urhobo figure already in his collection. They were carved by the same artist around 1850 and previously were separated for at least four decades. 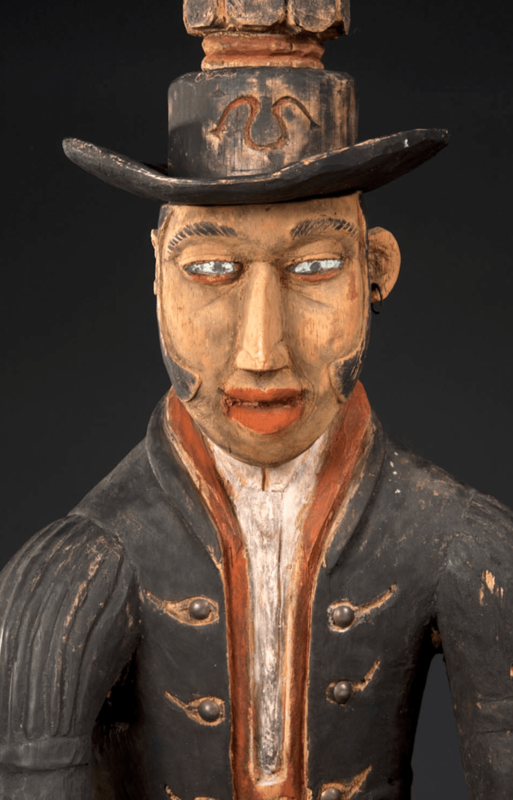 You can read all about this reunion in an excellent article by Urhobo specialist Perkins Foss in the latest issue of Tribal Art Magazine (No. 73, pp. 130-135). 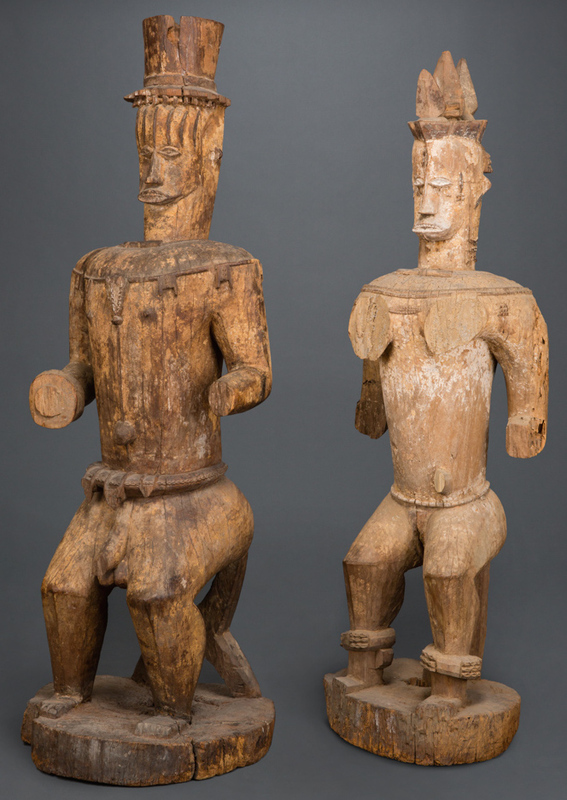 Pair of Urhobo shrine figures. Mid 19th century. Height: 143,5 cm & 138 cm. Image courtesy of the Africarium collection. This entry was posted in Fairs, News and tagged Urhobo on August 26, 2014 by admin. Nkundu Figure. Collection Fine Arts Museums of San Francisco, gift of Richard H. Scheller (2013.78.5) & Fang Figure. Scheller collection (L13.34.1). Ex Paul Guillaume. Pictures by Robert A. Kato. Embodiments: Masterworks of African Figurative Sculpture, organized by the Fine Arts Museums of San Francisco, will run from January 31, 2015 to July 5, 2015 and presents 120 pieces from the collection of Richard H. Scheller. It will be composed of classic and iconic sculptures as well as more unusual examples that challenge commonly held assumptions about African art; approximately 110 cultural groups will be represented. From this interview with Mr. Scheller we learn that he has already given certain pieces to the de Young (as the Nkundu figure above), and that it is his intent that the pieces of the exhibition will be given to the de Young in the future. The collection was assembled over nearly 30 years and many of the objects have never been exhibited before – so it’s certainly something to look forward too. Turns out that the Hemba figure on the front cover of Alisa LaGamma’s Heroic Ancestors is also in the Scheller collection. Hemba figure. Image courtesy of Richard Scheller. This entry was posted in Exhibtions, Museums, News and tagged Fang, Hemba, Nkundu on August 21, 2014 by admin. In January 1938, two feet below the ground of the Wunmonije Compound in Ife, a cache of bronze heads was uncovered while a foundation for a house was being dug. It would become one of the most important chance finds in the history of African art. Unfortunately no photos of the excavations exist. 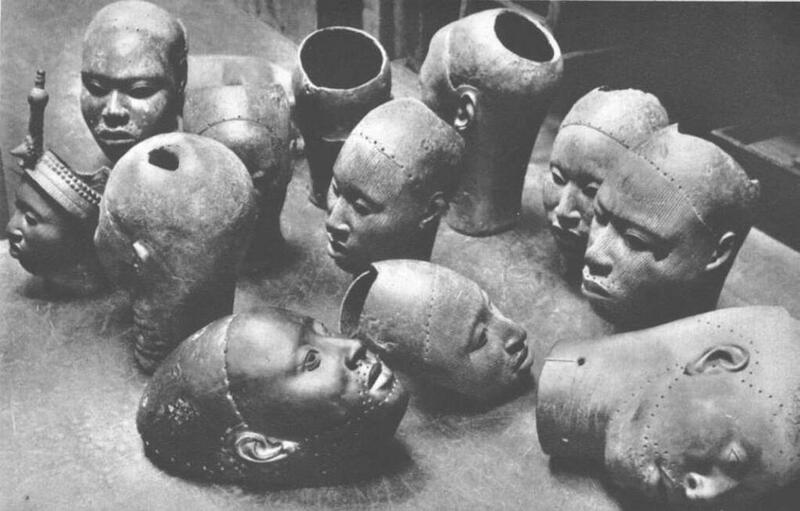 Shown above are some of the heads unpacked at the British Museum, where the Ooni had sent them in 1948. It’s quite a remarkable scene to see such an important part of Nigeria’s art history placed arbitrary on that table. The Wunmonije compound, then just behind the palace of the Ooni of Ife, formerly was located within the enclosing palace wall. While clearing away the topsoil the workmen had struck metal and further digging revealed a group of cast heads. Thirteen life-size heads and a half-lifesize half figure were unearthed. Soon after, the same site yielded additional finds of five more works: a life-size head, three smaller heads, and a torso. The identification and function of these heads remain uncertain. It remains a mystery why this cache was ever buried; possibly this hoard once formed part of a royal altar. Most of the objects found in the Wunmonije Compound ended up in the National Museum of Ife, but a few pieces left Nigeria. One is now in the collections of the British Museum – the head far left on the above picture. It was purchased in Ife by Mr. Bates, then editor of the Nigerian Daily Times and was subsequently acquired by Sir (later Lord) Kenneth Clark, Director of the National Gallery, acting on behalf of the National Art Collections Fund, which donated it to the British Museum in 1939. Two heads that were purchased by William Bascom (a research student from Northwestern University, Illiniois, who was based in Ife at the time) in 1938 were later returned to Nigeria as a gift in 1950 – a story documented in an article by Simon Ottenberg (Further Light on W.R. Bascom and the Ife Bronzes, in Africa, Vol. 64, No. 4, 1994: pp. 561-568). This entry was posted in Objects and tagged Ife on August 20, 2014 by admin. 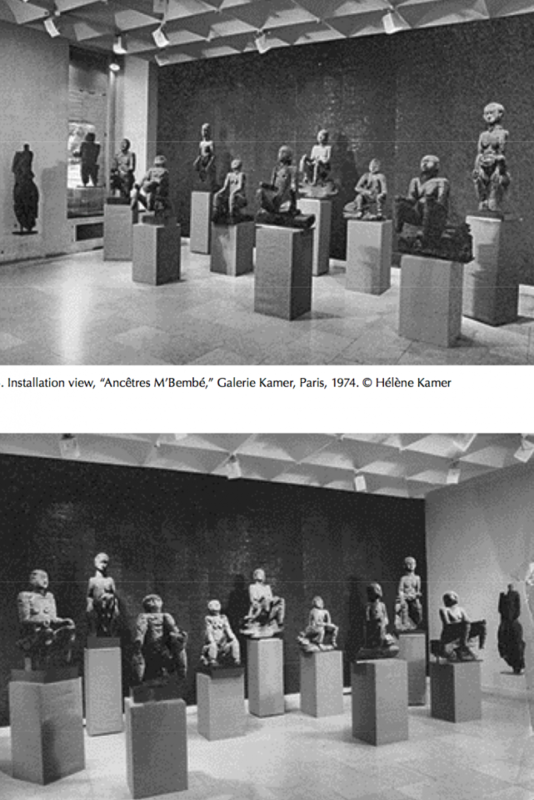 Please extend a warm art historical welcome to a new blog about African art: Imo Dara. This entry was posted in News on August 19, 2014 by admin. 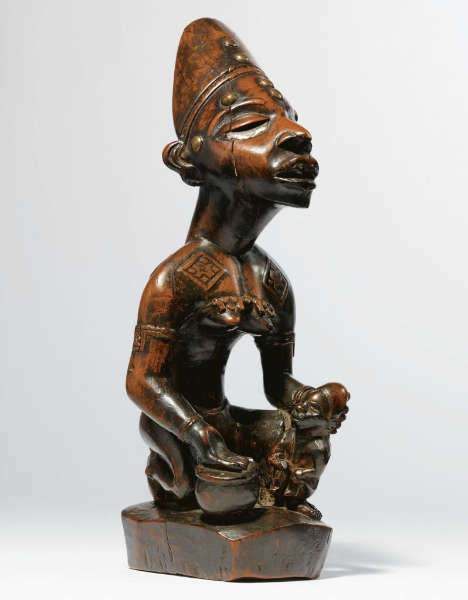 Mbembe mother and child figure. Height: 108 cm. Image courtesy of the Metropolitan Museum of Art (#2010.256). 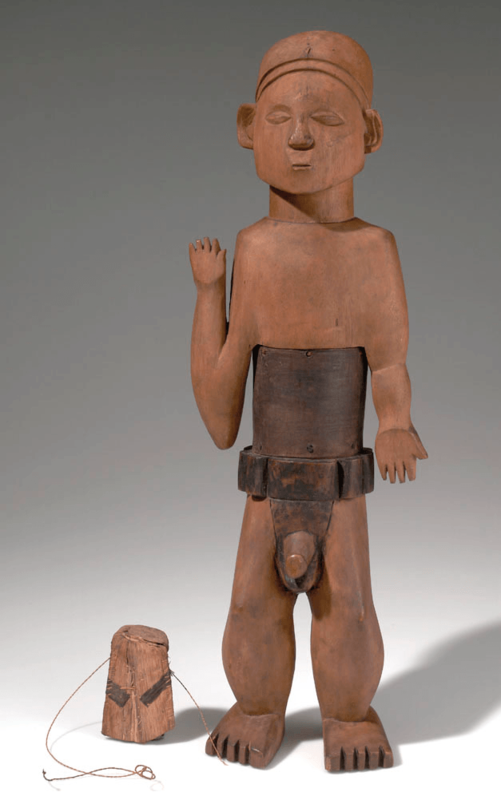 The upcoming exhibition Warriors and Mothers: Epic Mbembe Art will present 17 Mbembe figures at the Metropolitan Museum of Art and runs from December 9, 2014 to September 7, 2015. The exhibition is organized by Alisa LaGamma and Yaëlle Biro and will focus on the two most frequent themes of this type of sculpture: mothers nurturing their offspring and male warriors – originally these figures were sitting at the end of large communal drums. The catalyst for this exhibition is the above mother and child figure, acquired by the Metropolitan Museum in 2010 (info). In December 2009, this maternity figure was unsuccessfully offered for sale by Christie’s Paris (estimated € 500,000 – 700,000). It was later bought through Christie’s from its Japanese consignor, Hiroshi Ogawa, who himself had acquired it from Hélène Kamer (now Leloup) in 1974. It was Kamer who introduced the art world to Mbembe sculpture that same year with her landmark exhibition Ancêtres M’Bembe. The eleven figures of monumental stature featured in that inaugural show presented an at that time completely unknown sculptural tradition to connoisseurs of African art. The catalogue of this exhibition remains the sole monograph on the subject. Dispersed internationally among private and institutional collections, these works will be reunited in New York for the first time since 1974. The international recognition of Mbembe sculpture resulted from field collecting by the African dealer named O. Traoré in dialogue with the eye and instincts of Hélène Kamer. Already established internationally as a leading dealer in African art, Kamer had undertaken extensive collecting on the ground in Mali, Guinea, and Ivory Coast earlier in her career. She recalls that during the 1970s West Africans reg­ularly traveled to Paris with works that they had imported into France, and active collectors and dealers perused them in the hotel rooms of the sixth arrondissement that the Africans used as their base of operation. 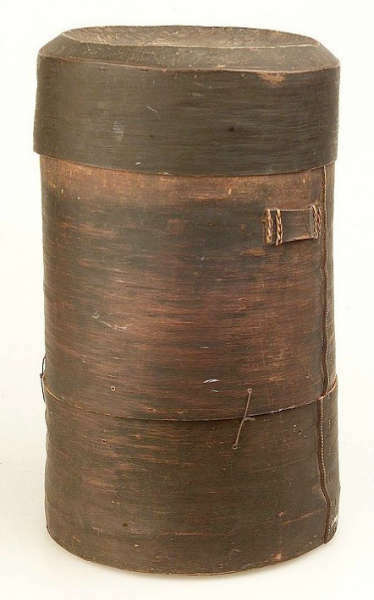 Through these channels, an influx of artifacts from the Nigerian-­Cameroonian border region commenced, as a result of two phenomena: European art dealers were not traveling to this area because of the Biafran War, and Malians engaged in the art trade during the 1950s and 1960s, having exhausted sources for mate­rial closer to home, had continued to seek out artifacts far­ ther and farther east. Kamer first became aware of Mbembe sculpture on September 29, 1972, when she encountered Traoré, a dealer from an established Malian family, at the hotel where he was staying on the rue de l’Ancienne Comédie. Among the works she saw that afternoon, a massive statue from Nigeria with broken arms immedi­ately caught her attention. In acquiring that work, Kamer inquired about its origins. In order to protect his source, Traoré declined to discuss specifics of where it had been collected but promised to return with other examples as well as information on their use, significance, and subject matter, which he would gather from an elder on his next visit to the region. From his base in lomé, Togo, close to the Nigerian bor­der, Traoré made two further forays to obtain additional works for Kamer. He returned to Paris from the first trip on February 6, 1973. At that time he provided the provenance of the works he brought with him, relating them to a small group known as the Mbembe, located east of the town of Abakaliki in the former Anambra State in the Cross River region. 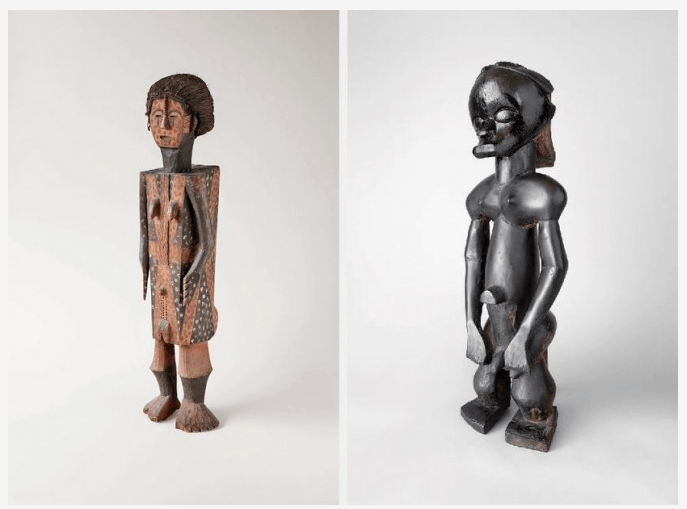 By the time these objects were collected by Traoré, they had long become a relic of past practices in the community that commis­sioned it several centuries earlier. This entry was posted in Exhibtions and tagged Mbembe on August 18, 2014 by admin. In the above lecture, given at Brown University on 3 October 2013, Christopher Steiner explores the history of collecting African art and examines how early patterns of collecting gave rise to the discipline of African art history and the related formation of a rigid and highly selective canon of authenticity. Steiner discusses how the continuous recirculation of the so-called “masterworks” of African art in museum exhibitions has led to the reproduction of accepted styles in the form of tourist art and neo-traditional copies. The lecture starts at minute 3:40 with the story of Gaston de Havenon and offers a refreshing view on African art and its appreciation in the West. This entry was posted in Research on August 17, 2014 by admin. A book which can’t be celebrated enough, Christopher Steiner’s African Art in Transit is a must read for anyone with an interest in the African art market. In it, Steiner gives an absorbing account of the commodification and circulation of African art in Africa itself. While so much attention currently focuses on an objects’ provenance or history in the West, this study documents the African side of the story. When the book came out in 1994, it was reviewed numerous times (for example here, here & here – with Sidney Kasfir adding her own interesting experiences) and better than I ever could – so I don’t wish to repeat the exercise myself. 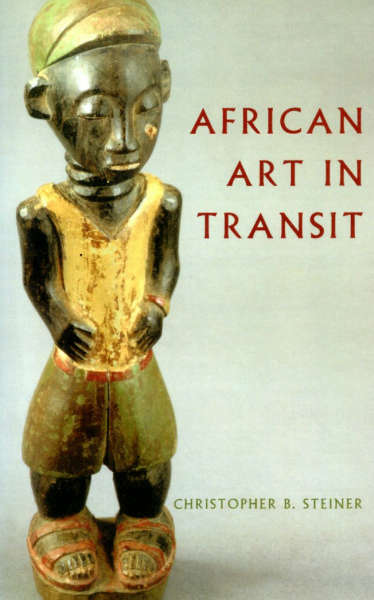 Quoting Denis Dutton in his review: “African Art in Transit presents a wealth of useful information for anyone who wants to learn how contemporary artifacts are marketed, how genres (like slingshots) can be virtually invented, and how the preconceptions of Westerners are exploited by clever salesmen.” All six chapters of the book are most revealing. Chapter 1 describes the situation in Côte d’Ivoire, more specifically Abidjan, where Steiner did his field-research. Chapter 2 describes the organization and basic business practices among traders and between them and their suppliers in upcountry villages. Chapter 3 describes the main features of trading in terms of bargaining, reckoning prices, determining strategies for profit and survival against competitors. 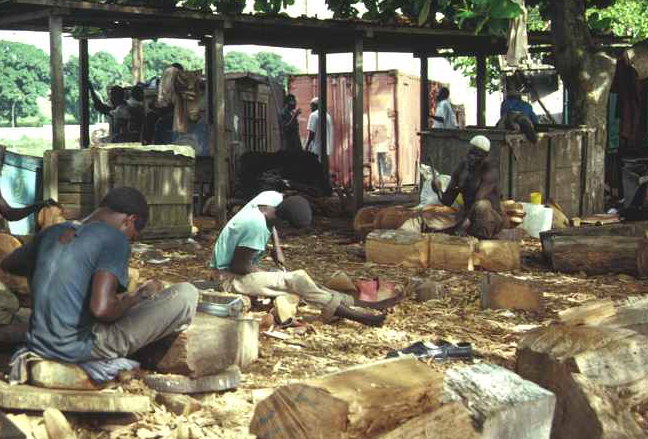 Chapter 4 discusses how the ethnicity and religion of traders usually insulate them from both their African suppliers and European buyers, as well as from the objects which they sell. Chapter 5 discusses the notion of authenticity which pervades nearly all thinking about what is or is not good (marketable) art – a very illuminating section. Lastly, chapter 6 examines the sociological concept of cultural broker as it may apply to African art dealers as middlemen between the different cultural spheres of creators, purveyors, and consumers. The text is enriched by numerous telling photos, find some of them below. 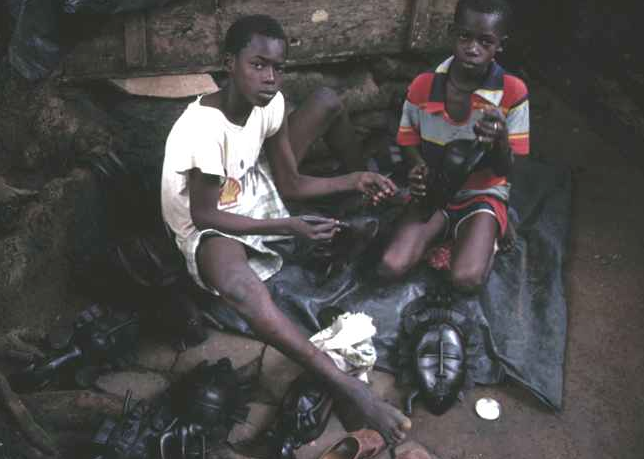 Young boys at the Plateau market place polishing Senufo masks with paste wax. Abidjan, April 1988. Image courtesy of Christopher Steiner (p. 17, fig. 1). Artisanal workshop. Port de Carena, Abidjan, June 1988. Image courtesy of Christopher Steiner (p. 37, fig. 10). 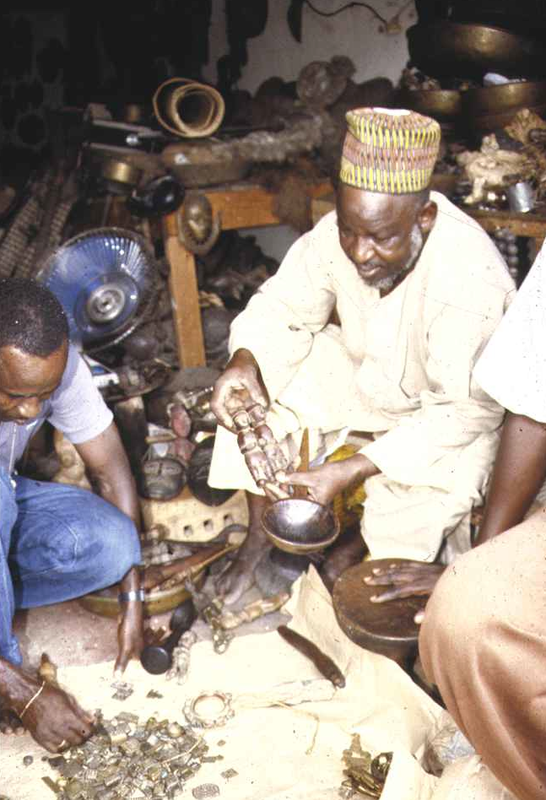 Hausa traders bargaining in a storehouse. Treichville quarter, Abidjan, June 1991. Image courtesy of Christopher Steiner (p. 67, fig. 16). 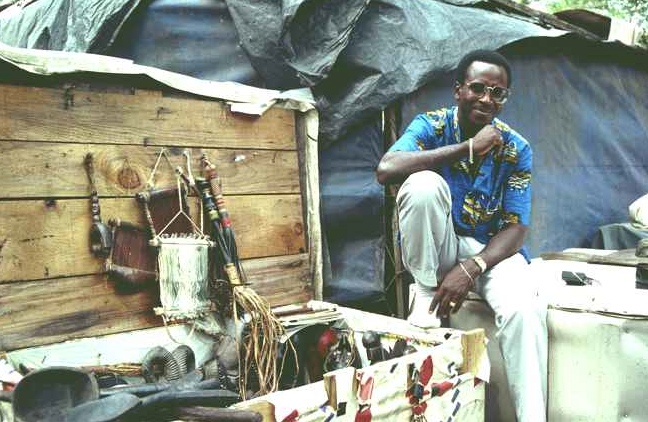 Hausa trader with wooden trunk in the back section of the Plateau market place, Abidjan, May 1988. Image courtesy of Christopher Steiner (p. 135, fig. 29). 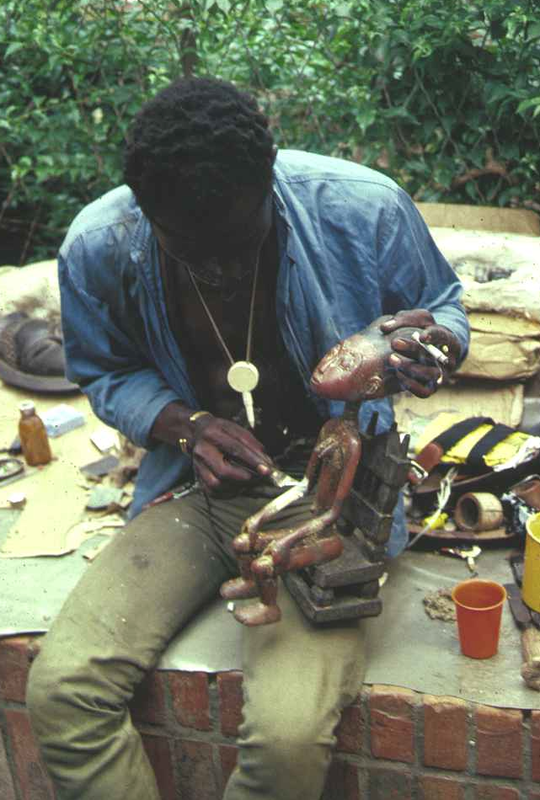 A carver repairing the arm on an Asante female figure which was damaged during shipment from the Kumase workshop where it was produced. Plateau market place, Abidjan, January 1988. Image courtesy of Christopher Steiner (p. 141, fig. 31). 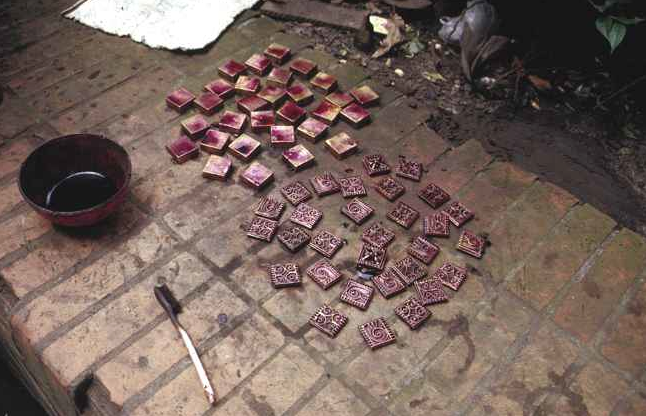 Small Akan brass boxes stained with potassium permanganate to dull the surface finish. Plateau market place, Abidjan, July 1988. Image courtesy of Christopher Steiner (p. 143, fig. 33). This entry was posted in Publications on August 16, 2014 by admin.